You’ve been introduced to five members of the PatientsLikeMe Team of Advisors so far: Karla, Emilie, Becky, Lisa and Dana. This month, meet Deb, a freelance medical writer who was diagnosed with multiple sclerosis (MS) in 2009. Learn about her journey and what being a part of the Team of Advisors means to her. Deb has spent most of her professional life as a freelance medical writer and editor. Over the years, she has worked with many health and medical organizations. Currently she works in cardiac surgery research for a major hospital system in the Washington, DC, metropolitan area. Deb’s primary professional interest has always been patient education. She believes that “knowledge is power”―that clear and accurate information can ease patients’ fear and uncertainty when faced with a serious diagnosis, that anyone is capable of understanding even the most complex research if it is presented appropriately, and that information doesn’t have to be dumbed down for patients to understand it. Deb was diagnosed with MS in 2009. 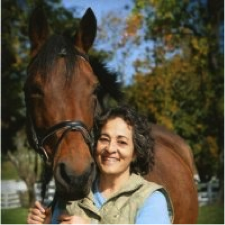 Her passion is dressage, and she credits her horse, Gwen, and riding as the most important and effective “treatments” for her MS symptoms. “I feel fortunate that, because of my work, I have been able to see clinical research from the perspective of both the patient and the researcher. I have worked with and for many organizations, researchers, and physicians over the course of my career, and I have found that, ironically, the patients themselves are often invisible in the research process. If patients are thought of as “cases” rather than as real people, and if patients don’t understand what is being done and why, then the research effort has lost what should be its central purpose. The story of how I came to be diagnosed with MS illustrates some important points that I feel are related to patient centeredness and the work of PatientsLikeMe’s Team of Advisors. At age 52, I couldn’t believe my ears, especially since my ex-husband had been diagnosed with MS many years before, very early in the course of our marriage. Back then, there wasn’t an MRI machine around every corner. It took 5 years after his first attack for him to be diagnosed. At that time, I was working for a major medical specialty organization, so I went to the library (no one had computers yet) and found everything I could about MS. Then we both started reading. At a time when the official slogan of the MS Society was “MS: The Crippler of Young Adults,” we learned that having MS didn’t mean you would necessarily end up in a wheelchair. The information we gathered reassured us. He went on to lead a totally normal life during the 10 years of our marriage. “Being a part of the ToA has been a profoundly rewarding experience. I have made friends that I know I will keep once our terms are over. Like my colleagues on the ToA, I am deeply grateful to have the opportunity to be heard, without condescension, as a person experiencing a disease and its effects, and to have an opportunity to have a say in how research is conducted. “Like my fellow Advisors and PatientsLikeMe itself, I believe that much can be learned from patients’ experiences, and this information should be used to design research studies. My own experience serves as an example of this. In the weeks and months after my initial diagnosis, I found that movement was vitally important. MS is, after all, a movement disorder. My fellow horsewomen rallied to my side, lending me their quiet mounts to ride until my symptoms abated and I could safely ride my own high-spirited (to put it politely!) mare again. Those women―and the horses themselves―kept me moving. When my current neurologist first met me, she told me that, having looked at my MRIs before our visit, she was amazed at how well I was doing. Although I don’t have scientific evidence for it, my belief is that my riding has kept the disease from progressing further than it has. They’re a group of 14 PatientsLikeMe members who will give feedback on research initiatives and create new standards that will help all researchers understand how to better engage with patients like them. They’ve already met one another in person, and over the next 12 months, will give feedback to our own PatientsLikeMe Research Team. They’ll also be working together to develop and publish a guide that outlines standards for how researchers can meaningfully engage with patients throughout the entire research process. So where did we find our 2014 Team? We posted an open call for applications in the forums, and were blown away by the response! The Team includes veterans, nurses, social workers, academics and advocates; all living with different conditions. Share this post on Twitter and help spread the word for multiple sclerosis. I knew nothing about this disease and was never interested in symptoms and treatment of it . I read this story today and see how we are all similar. Whatever the disease, it can have different symptoms, different diagnoses, different treatments … but one thing all diseases are similar – they limit us, make us think that we are special, they give us cause depression and withdraw inward. I am grateful to God that he brought me to this site. I was able to overcome my obsession with the disease and the fight against it is no longer for me to be the main task of life. I’m happy for Deb and I wish a joy her ! Greetings. I thank you Deb for sharing. My brother has been diagnosed with MS. It is good to know that I can visit this site and review stories similar to yours. You truly are a blessed soul. First, let me apologize to commenters for the length of time that has passed since you wrote. I haven’t been keeping up with the blog for a while now, due in part to (wouldn’t you know it) some MS issues I’ve been having, but I am back in the groove now. Julia: Absolutely, do NOT make MS the center of your life! There is no reason it has to be. When I was first diagnosed, this is the promise I made to myself — that “this whole MS thing” would just fade away into the background — something I had to deal with, like managing my allergies, but NOT something by which I would be identified. YOU ARE STILL YOU. Don’t let the disease define you! You say “all diseases are similar – they limit us, make us think that we are special, they give us cause depression and withdraw inward” — that is true only if you make it so. John: Thank you for your kind words, and my best wishes to your brother. It is devastating and almost world changing to receive this diagnosis, but as I said to Julia, the disease does not have to become the focus of your life. I hope that your brother will continue to find support on this site, as well as elsewhere.